2015 Moto Guzzi 1200 Sport Rosso Corsa. Picture credits - Moto Guzzi. Submit more pictures. The saddle is well padded and offers great support, weight distribution and a low centre of gravity. In classic black or elegant titanium grey, the 1200 Sport 4V celebrates the Moto Guzzi Italian heritage with its subtle green, white and red stripe detail. Price as new (MSRP): Euro 10434. Prices depend on country, taxes, accessories, etc. Emission details: 3-way catalysed with Lambda probe. Front brakes: Double disc. Stainless steel wave discs, radial calipers with 4 opposed pistons. Rear brakes: Single disc. Single fixed stainless steel disc, floating caliper with 2 parallel pistons. 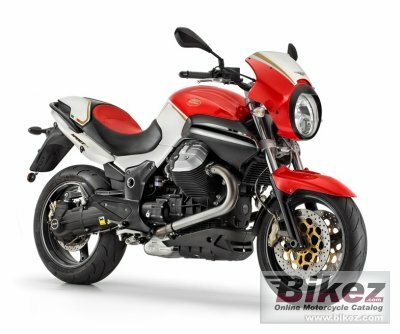 Ask questions Join the 15 Moto Guzzi 1200 Sport Rosso Corsa discussion group or the general Moto Guzzi discussion group. Bikez.com has a discussion group for every motorcycle. Here you may find answers to common questions about the model. If you do not find what you are looking for, you can ask questions. Try out the 2015 Moto Guzzi 1200 Sport Rosso Corsa discussion forum. You can sign up for e-mail notifications when other users answer you. If you have information about any technical issue related to this motorcycle, please leave a comment for other riders.